If there's one advantage to a flailing economy, it's that retailers and service providers will drop prices till you shop and stimulate their balance sheets, so there's always some sort of deal on the street, enticing your wallet out of its sabbatical. 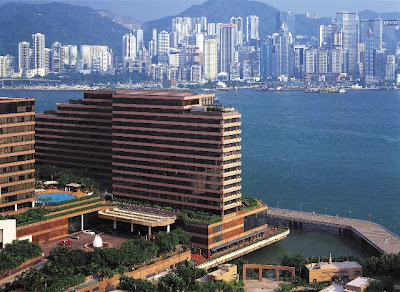 In this case, it's a night's stay at the InterContinental Hong Kong for Hong Kong residents, set at HK$1,999 + 10% -- still not cheap, but wait till you see the extras it comes with. 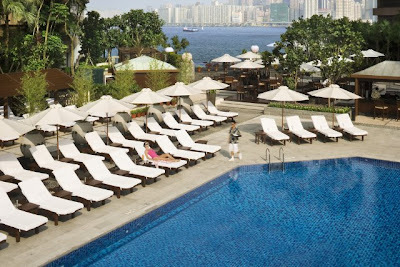 So if you will allow your resident Geek to do the math for you, that means if you hack off, say, HK$200 a head for the lunch, HK$100 or so each for the pool and complimentary class, you're really only paying HK$1,400 for the room, which you'll get till 8pm. I will also assume that since you're in a standard room, you probably will not be inviting a third person in (or that if you are, that person won't be needing a complimentary cot... no judgement.) And yes, I've considered the possibility that someone might have a child that is staying with them. But I will also argue that if you live in Hong Kong, you're not taking your kid to a hotel room to sleep adjacent to you for no good reason.